Approximately 80 high school students recently spent the day at Stage AE for a workshop hosted by Point Park's sport, arts and entertainment program. Located on Pittsburgh's North Shore next to Heinz Field, Stage AE is the second indoor and outdoor concert venue in America and features state-of-the-art lighting, acoustical systems and a one-of-a-kind reversible stage. "Stage AE has been a phenomenal opportunity for our students," said Assistant Professor Ed Traversari regarding the SAEM program's partnership with Stage AE. "Our classroom on site at Stage AE presents a great learning experience." 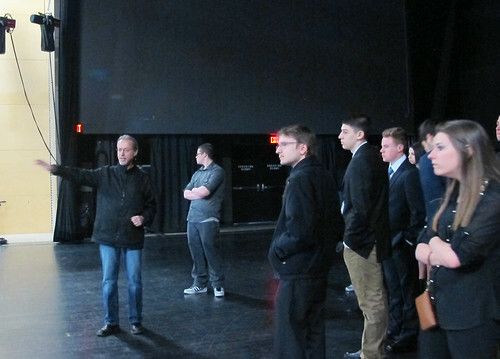 At the workshop, students toured the facility and heard from SAEM faculty members who gave an insider's view on working in the entertainment management industry. Students also had the opportunity to meet with Stage AE's Amy Cooper, director of marketing, and Kate Srigley, director of sponsorship sales, who served as guest speakers. "I learned the ins and outs of the entertainment industry. From famous athletes to famous bands, there are different ways to manage a variety of clients. My favorite part of the workshop was learning about how long it actually takes to set up for a concert. Everything is more complex than you would ever imagine," said Natalie Richards, a senior at Highlands Senior High School who will begin Point Park's SAEM program in the fall. Interested in attending an SAEM high school workshop? Register for the All-Access SAEM Summer Workshop happening July 15-17, 2013.